I've done a vampire look several times - it's a Halloween classic that never goes out of style. 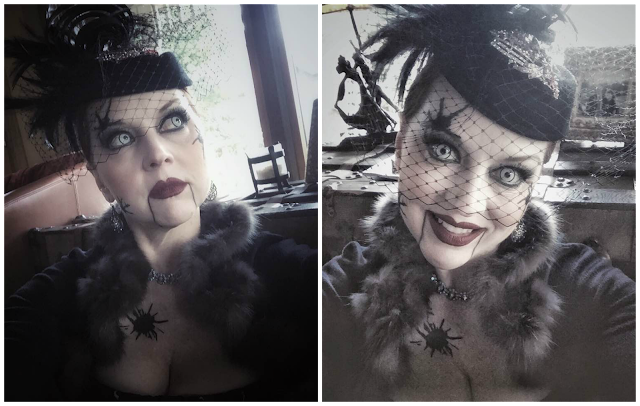 Theatrical lenses from VisionDirect; "custom fit" fangs from Amazon; and spiderweb lashes add Draculean drama, no boring black cape necessary! See the entire look here. You don't have to know me very long or very well to know that Fall is my favorite time of year and Halloween is my favorite holiday...and I love playing around with makeup and items already in my closet to create creepy, cute, or startling looks to celebrate the spooky season. This "broken doll" makeup look was easy to do with white powder, black eyeliner, an exaggerated lipline; and white theatrical lenses. Vintage millinery, a vintage dress; and 1940s jewelry already in my closet completed the creepy porcelain doll effect. You will never see me in a polybagged get-up from a pop-up Halloween shop. But I'll happily recycle bridesmaid dresses and switch up everyday outfits with spooky accessories. The less money I spend, the better! 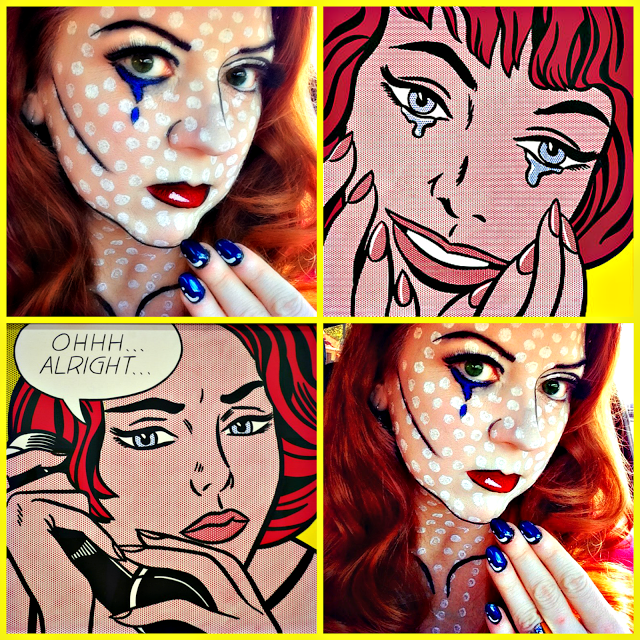 Indianapolis based makeup artist Kelly Oswalt for Red Carpet Reflection helped me create this Lichtenstein-like pop-art look last year, complemented by nail art I copied from Pinterest. The look was completed with a bold striped dress that, sans crazy makeup, I wear on the regular. See the entire getup here. In the last two years, I've really embraced the use of makeup to help me create my All Hallow's Eve persona. 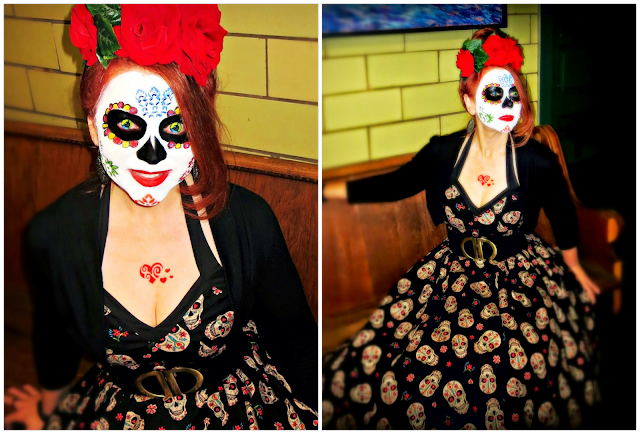 The first time I wore sugar skull and pop-art makeup, I called on my friend and makeup artist Kelly Oswalt to work her magic, but since then I've let my own inner artist out to play. 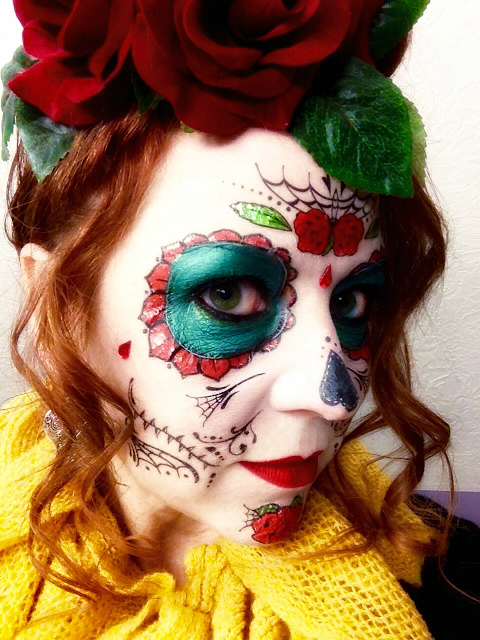 Temporary tattoos, red lips, and vibrant green eyeshadow paint a pretty sugar skull. I don't like makeup that rubs off if I touch my face (or hug someone), so I skip the liquids and creams found at Halloween stores and Wal-Mart. White powder eyeshadow finished with Urban Decay Makeup Setting Spray all over my face gives a smooth white complexion without the heavy, greasy feel. Eyeshadow is also gentler on the skin and less likely to cause breakouts....And the roses in my hair? - borrowed from a Christmas centerpiece! See the whole look here. My one costuming "splurge?" Theatrical contacts! The eyes really do have it when it comes to Halloween drama. I've collected a few pairs over the last several years, and with careful preservation, I've worn all of them more than once. In my own version of the Queen of Hearts, white eyeshadow once again subs in for foundation to get a white(er) face, while the free-hand heart over my eye was done in red lipliner topped with eyeshadow and setting spray. The crystals on my cheek came from the scrapbooking section of Hobby Lobby. I used eyelash glue to adhere them. See the entire ensemble, created from everyday items, here. Luckily, theatrical lenses are affordable and come in my prescription (the effect would be significantly dampened if I had to wear glasses over them...) If you don't need corrective lenses and can get used to the sensation of wearing contacts, there are even more options to choose from at even lower prices. My "go to" site is Vision Direct, and I've also had luck with Lens.com. 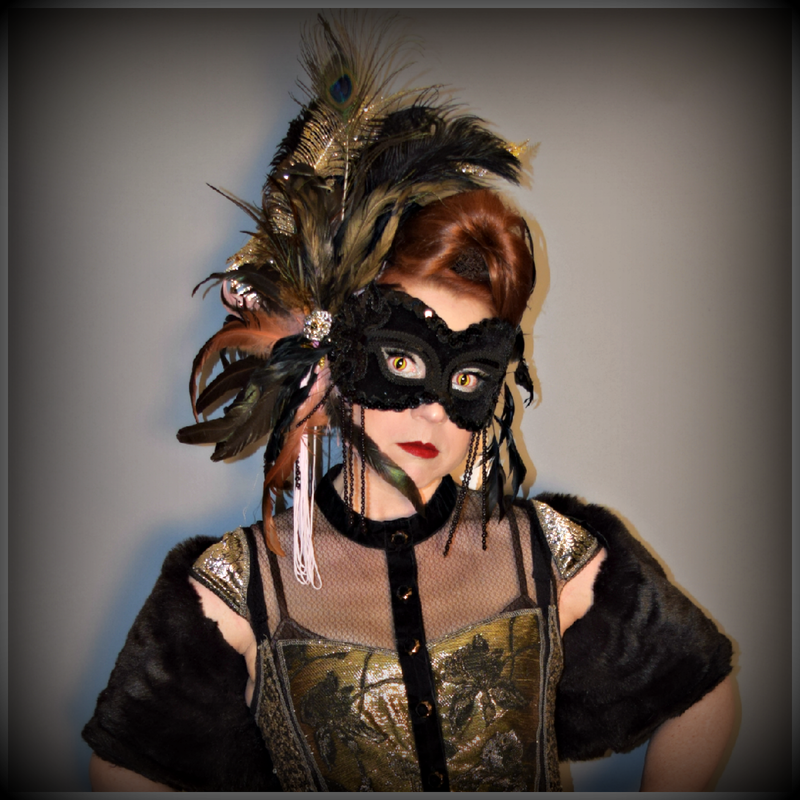 A traditional Halloween masquerade party called for a mask rather than makeup, but theatrical lenses add extra drama and amp up the spook factor. 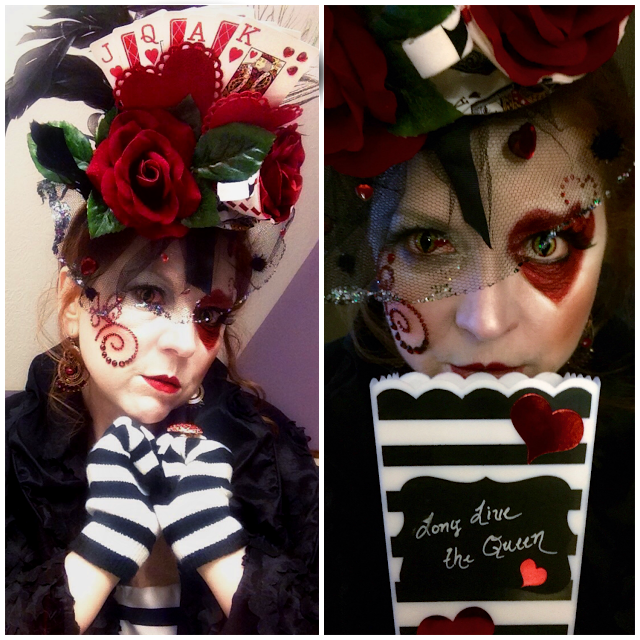 I wore the same lenses in both the Queen of Hearts and the vampire looks, above, and the zombie prom look, below - who knew they'd be so versatile?! 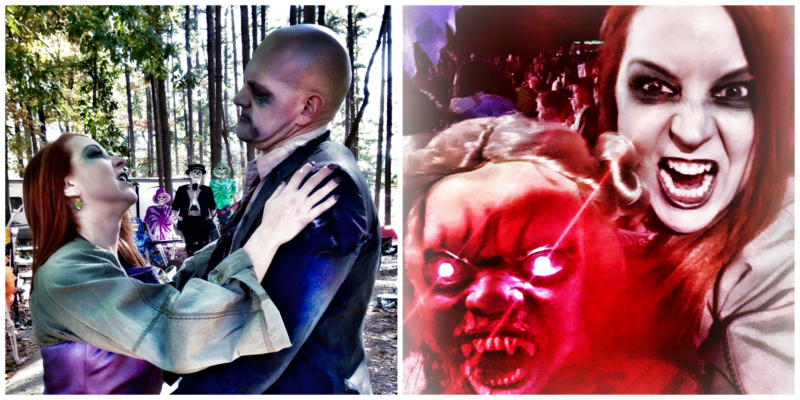 If you decide to try out theatrical contacts for yourself, I highly recommend looking for lenses that are the same diameter as your everyday lenses - they will be MUCH more comfortable. I once tried a pair that were significantly larger and, though they looked spooktacular, they made my eyes water so much I thought my makeup would run.... Just like shoes, amazing "eyes" are only great so long as you're not in pain. Happy Haunting! These patchwork theatrical lenses are creepy cool, but they are little larger in diameter than my everyday contacts and made my eyes water more than usual. This was the first time I tried a Dia de los Muertos look, and makeup artist Kelly Oswalt created the stark white "sugar skull." See more of this look here. White powder with grey and green eyeshadow creates a quick zombie face. 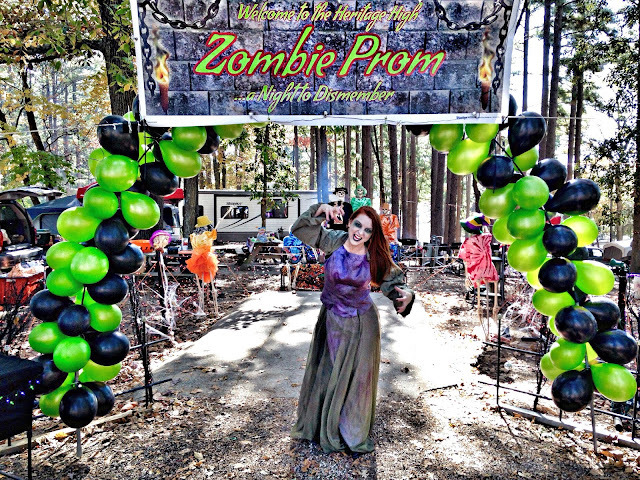 I ripped up an recycled an old bridesmaid dress for this "Zombie Prom" look. It was chilly, so a pair of cropped cargo pants did double duty as a last-minute makeshift "stole" (I just put my arms through the legs). If I did this look again, I'd add a bit of "blood" around my mouth to make it scarier. I'm linked up with Visible Monday! Oh, Elizabeth, I hope you can bring Halloween "spirits" to life in Oz! When I was working in Sydney several years ago, I fell in love with the country and wanted to move there permanently, but I do know I would dearly miss Autumn Halloween madness! Thanks so much for sharing, and I hope you have that party!